Salads often get a bad rap. They are often called ‘rabbit food’ and stigmatized as not filling and satisfying. These general assumptions usually come from hungry men (aka Eric) who can polish off two burgers (yes you read that right, TWO) in one sitting. But I love salads! And I have been on a major salad obsession kick lately. This obsession is either meet with a warm welcome from Eric (that boy loves him some taco salad) or meet with major complaints (salad again?!?). So finding salads that will curve my weekly daily cravings AND keep Eric full for longer than 2.5 seconds have been a struggle. But thankfully I have found two salads (besides Eric’s covenanted taco salad) that Eric loves, keeps him full for at least an hour, and that satisfies my cravings. This is one of those salads. 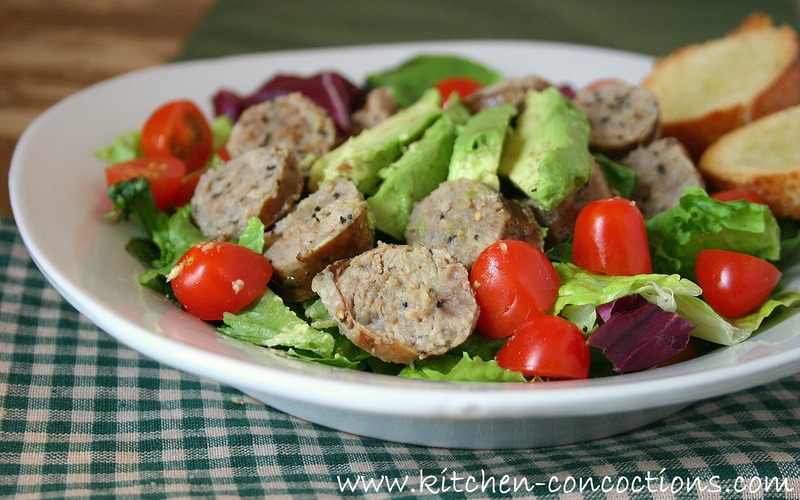 Sausage in a salad may seem a little strange, but this sausage is cooked to perfection and works wonderfully with the other ingredients of this salad. Eric and I both loved this. I served this with some simple tomato bruschetta and had a meal that Eric has asked for every week since. I call that salad success! Heat 2 tablespoon olive oil in a 12-inch heavy skillet over moderate heat until hot but not smoking, then cook sausages, turning over once, until well browned, about 8 minutes total. Add 2 tablespoon balsamic vinegar, water and herbs de Provence. Cover, cook, stirring occasionally, until sausages are fully cooked, about 5-8 minutes. When cooked thoroughly, remove from pan and cool slightly and slice. Mix thoroughly the remaining olive oil, balsamic vinegar, sugar, and salt and pepper to form dressing. 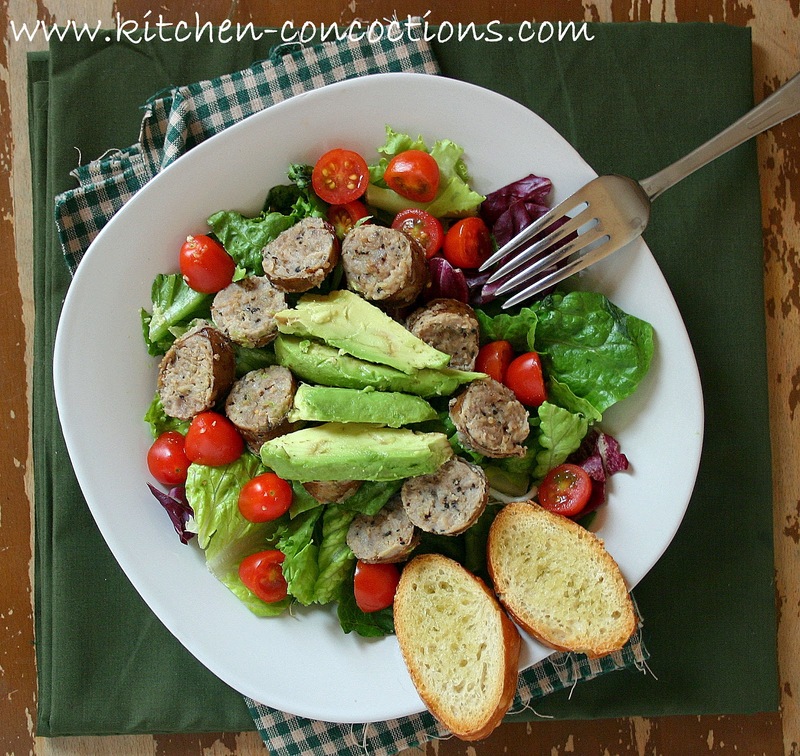 Gently toss the avocado, salad greens, tomatoes, sausage and dressing. Serve immediately. I love this – delicious and filling! !